Forever 21 Makati SALE Event!!! On March 16: Present your F21 Mastercard AND SMAC/BDO Rewards, get 20% off on regular items with a minimum purchase of P5,000 until 12nn only. Present your SMAC/BDO Rewards OR SMAC/BDO Rewards, and get 10% off on regular items, until 12nn only. 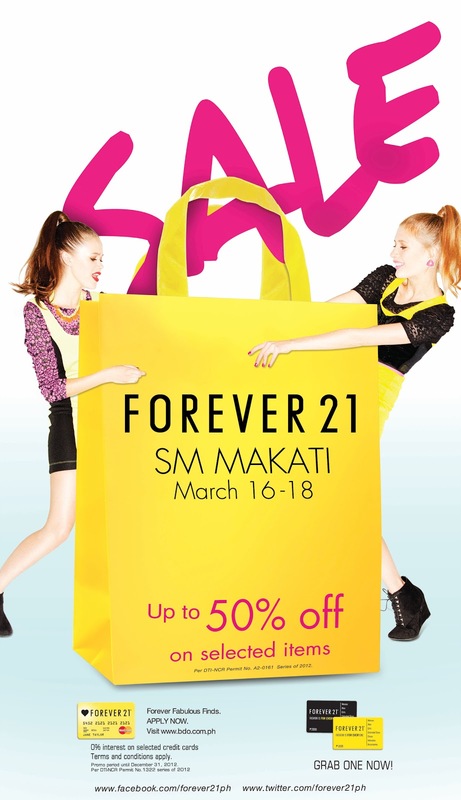 On March 16 12nn onwards until March 18, F21 Mastercard holders can get 10% off on regular items, with a minimum purchase of P5,000. *BDO cardholders can avail of 5% rebate with a minimum purchase of P5,000 for all 3 days.